Images from Tom Dowling's visit to the Henry Ford Museum in Dearborn, MI in August, 2007. 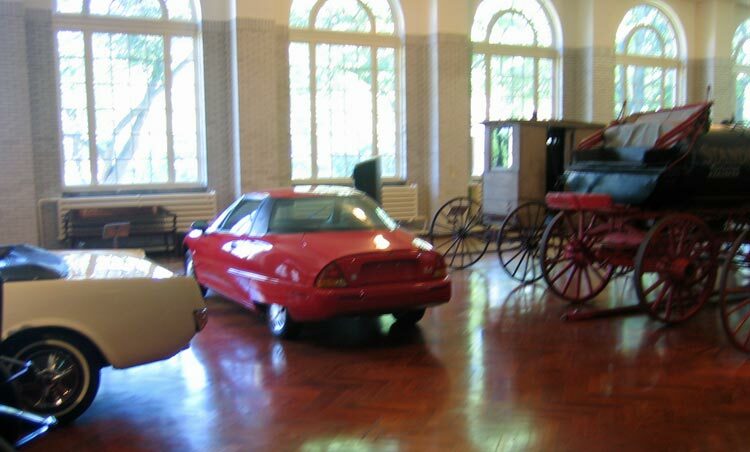 The Henry Ford Museum in Dearborn is known simply as "The Henry Ford." It's a huge museum, featuring items such as a DC-3, Ford Trimotors, the Rosa Parks bus, many presidential limos (including the one that JFK was riding in on that fateful day in Dallas), the chair Lincoln was sitting in when he was assassinated, and hundreds of vehicles. In August, 2007, my wife and I spent two days touring the museum, and still didn't come close to seeing it all. 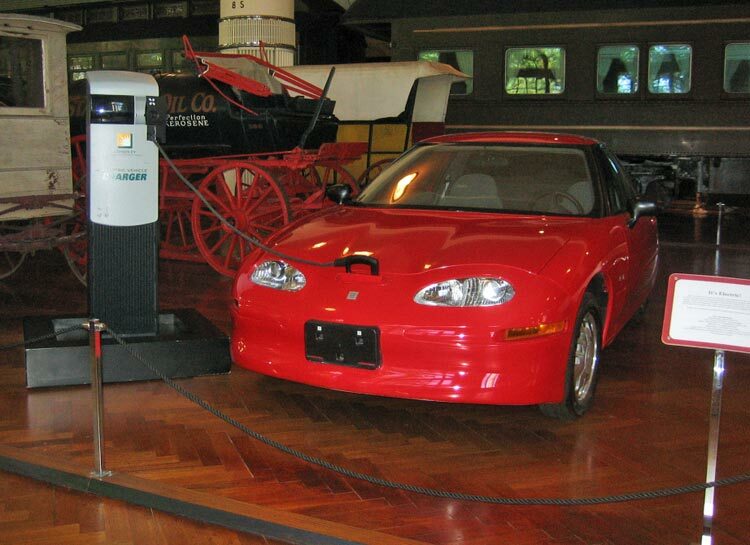 The EV1 is in a back corner at The Henry Ford, mixed in with a bunch of really old stuff, right next to a very old kerosene tanker wagon, and a three-wheeled EV (from 1901, I think) that reminded me of an ancestor of the Sparrow. There was another very old EV (1896?) nearby, and an old fire engine or two, and an old horse-drawn hearse. Kind of a hodge-podge area. 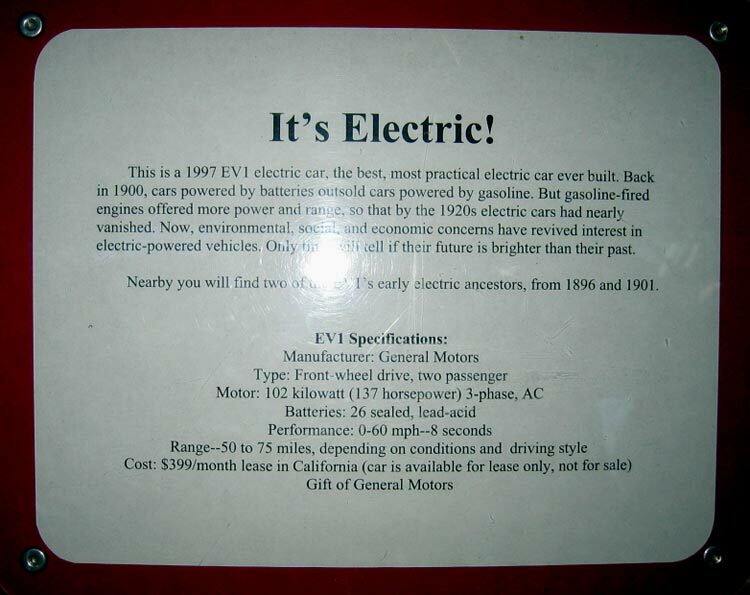 We talked to a few locals who had no idea what the EV1 was, or what they were looking at. We watched quite a few people go by, most of them not taking any notice. 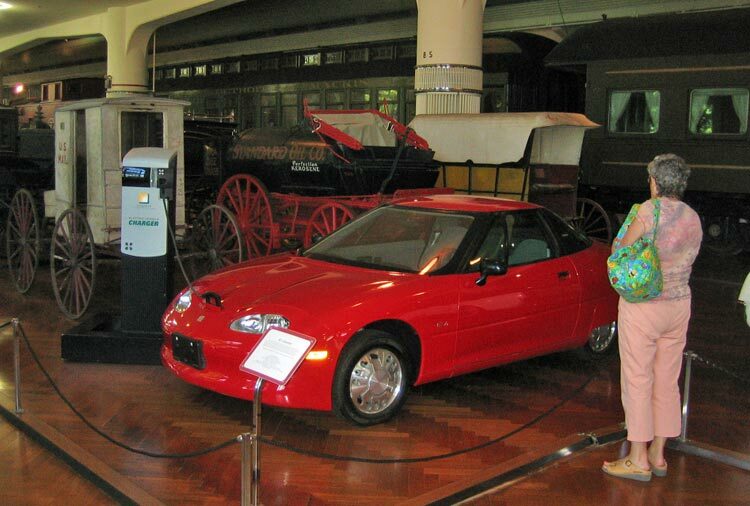 It took quite a while to find the EV1 in this huge museum. I asked several museum staffers, and none knew what I was talking about. Finally, one staffer got on the phone to ask somebody else. The person he called knew where it was -- he told him "It's the red one -- right down the aisle from you." The EV1 was about 100 feet from where this staffer works every day. At least the EV1 was in good shape, nice and shiny, and didn't look neglected. The placard didn't say much, but it wasn't offensive. 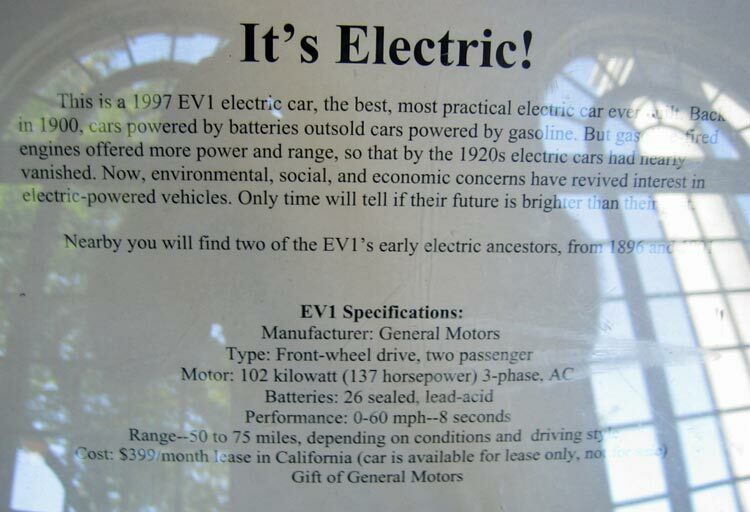 The EV1 was right on the aisle, even though it was in a less-visited corner of the huge museum. Although I didn't have a chance to get close enough to verify the VIN, I'm told that it is V410, which was an EV Rentals vehicle, spotted by me at the EV Rentals Sacramento Airport location in August, 1999, and again that same month at Saturn of Fulton Avenue in Sacramento, evidently in for service.